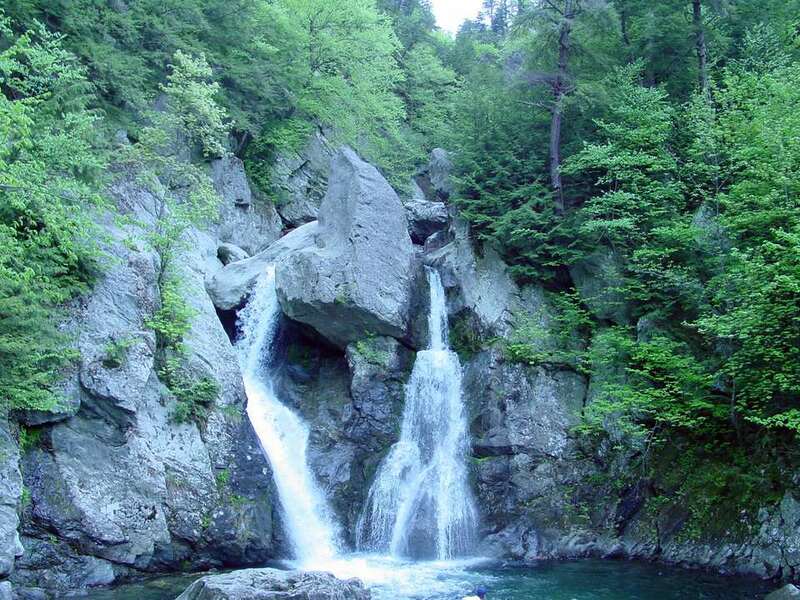 It's not Niagara Falls, mind you, but Bash Bish Falls, tucked away in the southwest corner of Massachusetts near the state's borders with Connecticut and New York, is the state's highest waterfall. Actually, it's the state's highest waterfalls—you get two waterfalls for the price of one when you visit Bash Bish State Park, and best of all, the price is free! Bash Bish Falls State Park is actually located within the Mount Washington State Forest, a 4,169-acre forest preserve operated by the Massachusetts Department of Energy and Environmental Affairs. The state forest has 30 miles of hiking trails and a limited number of wilderness camping sites that are also available free of charge. However, most visitors have one goal in mind--a glimpse of the twin falls that drop in a dramatic, 80-foot "V" over steep boulders in their race to contribute to the spray of foam in the serene pool below. Picturesque Bash Bish Falls has been a popular Berkshires tourist stop and a favorite subject of painters and photographers since the mid-19th century. When you come upon the falls, you'll feel as though you've discovered a secret, woodland cascade, even though there are likely to be many other waterfall pilgrims on your path unless you visit Bash Bish early or late in the day or during the winter months. There are two access points for viewing Bash Bish Falls. Following signs from Route 41 in Egremont, Massachusetts, you'll first arrive at the upper parking lot on the left, from which the waterfalls are about a 15-minute downhill hike. Remember—you'll have to hike back uphill when you've had your fill of the cascades' whooshing roar. The hike is moderate, though it can be slippery in parts if there has been significant rain. An easier point of access is the lower parking lot, which is the second parking area you'll reach on the left. Directions: Bash Bish Falls State Park is accessible from Route 41 in the town of Egremont, Massachusetts. From the Massachusetts Turnpike (I-90), take exit 2 for Route 102 West and continue to Route 7 South. Route 7 South joins Route 23 West, and where they diverge, continue on Route 23 West to Route 41 South. It's just a short distance to the entrance road for the Mount Washington State Forest and Bash Bish State Park--watch for signs on the right. From Connecticut, follow Route 44 West to Salisbury, where you can pick up Route 41 North to the park entrance on the left, just before the junction with Route 23. From New York State, follow Route 44 East to Salisbury, then follow the Connecticut directions above, or follow Route 23 East to Route 41 South. Hours: Dawn until a half-hour after sunset. Bring Along: Sturdy hiking shoes or boots, bug spray, sunscreen, and a camera. Camping: There are 15 wilderness campsites available in the Mount Washington State Forest, located a hike of about a mile and a half from the State Forest headquarters on East Street. There is no charge for use of the campsites, and access is on a first-come, first-served basis. Maximum camping party size is five people. Hotels Near Bash Bish Falls: Compare rates and reviews for Egremont-area hotels with TripAdvisor.